The greatest benefit of a flipbook over a traditional PDF is the opportunity to collect and measure valuable statistics about your flipbook viewers and your flipbook’s content - giving you the opportunity to objectively measure your marketing investment & content curation. 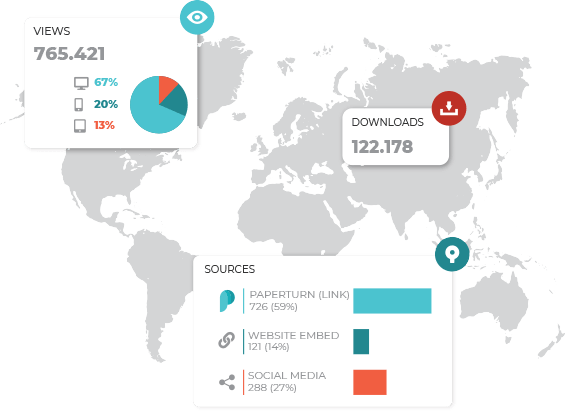 Use Paperturn’s built- in statistics to gain simplified but insightful information on your readers and the source of how they came to view your flipbook. Get real-time data about the number of views, downloads and your readers’ device, operating system and more. Visit our guides to learn more about our built-in statistics and how to integrate Google Analytics on your Paperturn account or a specific flipbook.